Before I begin, I should tell you all that I am a firm believer of the ‘pineapple most definitely does not belong on a pizza’ movement. The two things simply do not need to co-exist together. 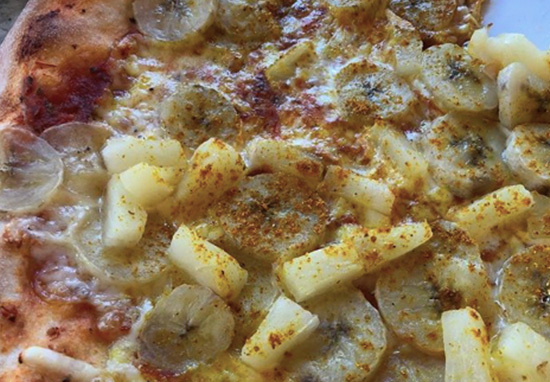 In what world is it acceptable for fruit to ruin a perfectly good pizza? None, there is no world where that is okay. And in case you’re otherwise misinformed that it is, I’m here to ruin your day just that little bit more because, apparently, people in Sweden believe that putting banana on pizzas is an alright thing to do. Not just a little bit of banana either – it looks like an entire bunch has been chopped up and thrown haphazardly all over the once delicious pizza. A travesty if I ever saw one. I wish I could tell you it gets better but, if anything, it gets worse. If you didn’t think that was possible, wait ’til I tell you what other toppings come with this Swedish delicacy. According to Reddit user u/elpintogrande, the pizza, also known as ‘Pizza Afrikana’, also has curry powder, mushrooms and peanuts as toppings. I’m sorry, what? Who came up with this concoction and where do they live because I need to send them a strongly worded letter right now. According to Huffington Post, unusual pizzas became popular in Sweden because the first pizza restaurants that opened in the country were owned by the same family – who didn’t necessarily have Italian roots. As a result of this, toppings were randomly added to pizzas whenever they were demanded by customers, meaning soon there were a wide range of extremely unusual concoctions. So there’s the ‘Pizza Hajk’, which is served in Pizzeria Värmland in Orebro. The toppings start out normally, with tomato sauce, cheese, chicken and mushrooms all listed. However, things start to get weird when you add raisins, peanuts, banana and curry to the mix. Then there’s the ‘Pizza Fruit’ from Pizzeria Mini Mac in Gothenburg, which has canned fruit cocktail (I’ve just been informed what that is) and chocolate for toppings. Which would maybe be okay if it was one of those sweet pizzas, but no – it still has tomato sauce and cheese on its base. Another one I just can’t get my head around is the ‘Pizza A La Duck’ from Pizzeria Bosporen in Leksand, which as its name suggests, has duck as its primary topping. It doesn’t stop there though, because it also boasts chanterelle mushrooms, blackcurrants and honey. If you’re a fan of unusual pizzas but don’t want to travel all the way to Sweden to try one, I might have just the thing for you. 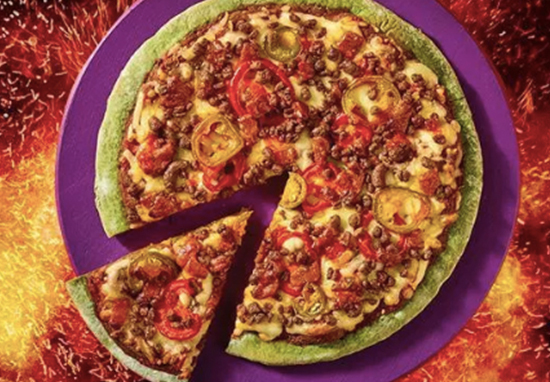 Morrisons have launched a Halloween pizza, which is made with chilli sauce that is 200x hotter than jalapeños. The chilli in question has a Scoville rating of one million but it doesn’t stop there. The cheese, known as ‘R.I.Pizza’s Reaper chilli cheddar’, has been made with the infamous Carolina Reaper, aka the hottest chilli on the planet. The ideal treat – or trick – for those of you who want to get your spook on this Halloween. 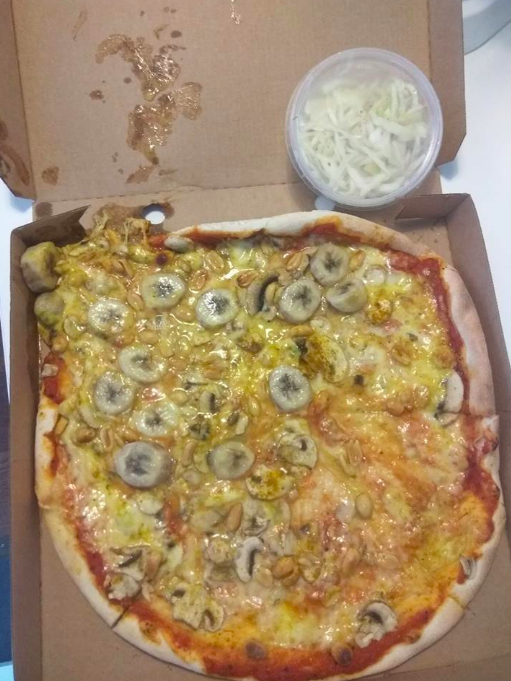 Banana Pizza, or Pizza Afrikana as it's known in Sweden. There's curry powder on the cheese, mushrooms, and peanuts.